A road movie about teenage Guatemalan immigrants and their journey to the U.S. I knew very little about this film before seeing it, other than its basic plot – 3 teenagers set out from their home in Guatemala to try and make it to America. On the face of it, this is a story we’ve heard before, but The Golden Dream packs an emotional punch that left the entire audience in my screening rooted to their seats long after the credits began to roll. The story follows Juan, Sara and Samuel (all played excellently by non-professional locals) as they embark upon their journey – with an early scene setter showing their torrid existence on massive landfill sites in Guatemala. The first half hour of this film has very little in terms of dialogue and score, but this does not diminish the film – much of that thanks to the excellent cinematography which captures the scale of the journey on the Mexican train lines. Soon into their journey the trio meet a tzotzil native named Chaulk (another newcomer), who does not speak Spanish and whose speech is left unsubtitled – putting the viewer in the same situation as the 3 kids who don’t understand him. I loved this technique, as we share the others’ frustrations and joys as they break the language barrier. The kids face an array of challenging situations on their journey, from heroin dealers to gringos looking for ransom opportunities and it is hard to review this film without wanting to discuss the fates of each of the main characters. I would, however, warn against seeing this film on a first date or if you’re feeling blue. Feel-good it is not. 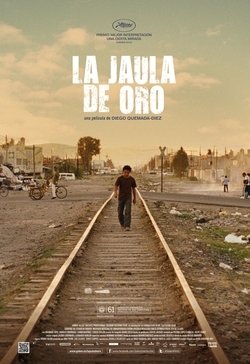 That said, I can see why this film won 9 Mexican ‘Oscars’, including Best Picture. It is a simply breathtaking piece of film-making. Film maker Diego Quemada-Diez has made a movie that is gritty, enthralling and tense, and I fully expect to see this film amongst the Best Foreign Language Film nominees, come awards season next year. From its opening scene of Sara cutting her hair to look like a boy to its final heart-breaking sequence, this film will stay with you long after leaving.